Be the first to share your favorite memory, photo or story of Ceola Clair. This memorial page is dedicated for family, friends and future generations to celebrate the life of their loved one. 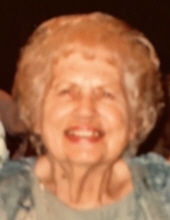 Ceola Clair “Dee Dee” Loosch, 90, of Colts Neck Township passed away on Tuesday, April 9, 2019 surrounded by her family at her home. She was born in South Amboy and had resided there before moving to Colts Neck 58 years ago. Dee Dee enjoyed spending time with her grandchildren and great grandchildren, loved to cook and bake for her family and friends, enjoying gardening at her home, and caring for animals, especially her dog, Lulu. She was the widow of Robert A. Loosch who died in 1997. She was also predeceased by a son-in-law, John Brzezniak, and two brothers, Fred and Richard Allen. Surviving are a son, Robert A. Loosch and wife Cheryl; two daughters, Cindy Kresky and husband Marc and Gina Brzezniak; a sister, Barbara Loosch; eight grandchildren; and 12 great grandchildren. The viewing will be held at the Higgins Memorial Home, 20 Center Street, Freehold on Friday from 5:00 to 9:00 p.m. Funeral services will be held at the funeral home on Saturday at 10:00 a.m. followed interment at Old Tennent Cemetery, Tennent. To send flowers or a remembrance gift to the family of Ceola Clair "Dee Dee" Loosch, please visit our Tribute Store. "Email Address" would like to share the life celebration of Ceola Clair "Dee Dee" Loosch. Click on the "link" to go to share a favorite memory or leave a condolence message for the family.